Last night (Wednesday) we watched this year’s remaining bakers compete for a place in the semi-finals in the Great British Bake Off‘s first ever Tudor week. 2. Andrew made pies that MOVED? Yes, this week saw an actual mechanised pie. 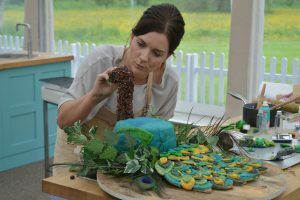 Candice’s showstopper was a complete masterpiece, and won her the title of Star Baker! 5. Sorry, but can we talk about those jousting knights? 6. Did we spy a bit of flirty banter between Paul and Mary? Mary’s a sucker for that intense Hollywood stare. 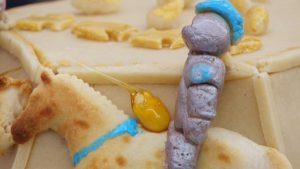 Does anything phase Bake Off’s Mr. Smooth? Anyone else in tears? Farewell sweet Benjamina. 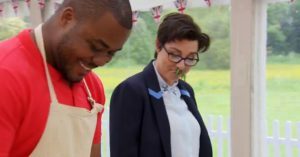 Next week Candice Brown, Andrew Smythe, Jane Beedle and Selasi Gbormittah will be baking like their lives depend on it in the semi-finals. Who will be the next to go? We can’t quite call it. « Does Game of Thrones season 7 have a MAJOR reunion in store?